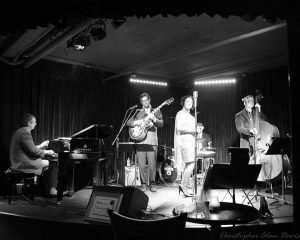 Sadly, long-running Columbus jazzy torch blues outfit Anna & the Consequences (photo by Christopher Alan Davis) has announced its last public Columbus show. An ALL STAR edition of the band, including Tom Davis, Caleb Hutslar, Joe Nelson, Ron Hope, Darchelle Williams and more, will play the “Blues Brews & BBQ” series at Notes on Thursday, December 14th at 8pm – more details are available here. To honor this momentous occasion, I reached out to the band’s vocalist Anna Paolucci for more details and thoughts on the band and the future. Keep reading to learn more – best of luck in the future Anna! I was sorry to hear that Anna & the Consequences have scheduled their last shows. What led to this decision and transition for the band? Anna Paolucci (AP): Thank you Andrew, it’s appreciated. There are a few private events on the calendar yet but nothing open to the public after this Thursday December 14th at Notes, and the Akron finale Friday December 22nd at BluJazz. I realized it was time to begin preparing for the inevitable move back to my hometown Akron, Ohio, to enjoy my family elders while they are active and mobile. The abrupt loss of my father, Roland Paolucci, last year just made the timeline shorter than originally planned. Columbus has been home for 30 years. I will miss this city, its people and the culture. Luckily, the Consequences (AATC) were blessed with a nice handful of performances in Akron at the famed BluJazz and Mustard Seed locations. That gave us the opportunity to invite wonderfully gifted, Akron based professionals on stage, and to forge musical relationships with some of my father’s peers, students, and those he mentored to replace himself when retiring from the University of Akron Jazz Studies Department and the Cleveland Jazz Orchestra. What an honor it is to have legendary trumpeter Jack Schantz and drummer Mark Gonder (I’ve known both since I was 10! ), or master drummer Jim Rupp and pianist extraordinaire Rock Werhmann, swinging hard behind me. Certainly makes the idea of moving north a bit easier with those recent experiences in my pocket. Meeting talented UofA students like Rob Sobnosky, Nick Paparone, Dillon Shidemantle, Josh Leslie and Kat Stahl allowed AATC to host them for their own set and one backing me. We reworked arrangements and now all are honorary Consequences. Nick and his guitar will be with me this Thursday at Notes, and again at the Akron finale on the 22nd at the aforementioned BluJazz. Can you tell us about some of your favorite memories of playing with the band? AP: Musical artists strive for moments when the chemistry is magical, everyone is locked in and the music just flows. This year’s Food Truck Festival and Oktoberfest had that in spades. 2010’s Champagne Under the Stars at The Refectory with the early incarnation of AATC was a real treat. We were acoustic wood and strings back then, with some Tin Pan Alley tunes in the chart book. Ms. Elliot 12Trees has a voice like an angel; add Jim Scarff and Phil Maneri plus a gorgeous crowd while the sun set and moon rose? Yep, that evening still tops the list. In 2014 we opened for Paul Revere and the Raiders at Huntington Park as a trio, now that was a real blast! Looking out from the stage centered on a gorgeous green field of that big stadium was nerve-racking, but the crowd was singing the callbacks to “King Size Papa” in no time, so nerves disappeared pretty quickly. Rick Soriano and Dan Sagraves were on fire that day and everyone was dancing in their seats from the waist up, what a sight! Being invited to perform at the Lincoln Theatre was also quite an honor. The musical history and legendary musicians working that stage before and since is quite empowering. I imagine it’s much like performing at the Grand Ole Opry. There is nothing like the superior sound in a great hall, I’m spoiled for life now. Gigs at the Clintonville Farmers’ Market and Pearl Alley Market were always so much fun. Encouraging the little ones to dance and play with the percussion instruments, getting the parents to stand still and enjoy for a moment – I really love that. Please tell us about the all-star lineup you’ve assembled for the show on the 14th. AP: This one time only HEAVY HITTING lineup features top local, regional and international talent like hip cat guitarist and bass guitarist, Tom Davis (Vaughn Wiester’s FJO). Davis has performed extensively as leader and sideman throughout Ohio and UK. I first heard Tom with local blues funksters, The Broadstreet Lineup. I was hooked. This man can swing, groove and take you to heaven and back during his solos. Akron jazzer Nick Paparone plays tasty licks on guitar as well. With both guitarists on stage the place will be smokin’. Crème de la crème pianist Caleb Hutslar adds his own roadhouse blues to the mix, good luck sitting still. Bring on upright bassist and guitarist Andy Kuss who croons just like the rest already on stage and you bet the place will be swaying. Now add Ms. Ryan Stolte-Sawa, the cherry on the sticky sweet banana split that is Anna & the Consequences ALL STARS. Ryan’s voice is delicate yet strong, golden. She even makes heartbreak feel good! But the real soul sister joining us for an encore is Ms. Darchelle Williams – better hold on to your hats! Did you say Extra whip cream? You got it cuz we’re serving up Joe Nelson on skins and brushes PLUS legendary Ron Hope on drums and percussion. Caleb and Ron played together in Charged Particles many moons ago along with AATC’s Rick Soriano some 15 years ago so this will be a welcome reunion. Due to date changes Rick is playing across the street until 10pm – we hope he can pack fast and join us at Notes. Myke Rock (Ray Fuller and the Bluesrockers) will thump his axe before taking to the wind and relocating to another continent soon. But when it comes to the nuts, Jeff Tobin is the guy. As singer, songwriter and guitarist in The Jeffs, his hilarious take on life is clear. I love the songs, the guy and his fantastic collection of suits so obviously he had to sing “Baby It’s Cold Outside” with me, right? ALL STARS that make one delicious “Banana Split For My Baby” … you bet we will do that Louis Prima tune Thursday at Notes! Do you have a special program, theme or material planned for the show? AP: Yes, it’s all about JOY, seasonal and otherwise. Expect four part vocal harmonies, a retrospective of our chart book with as many genres of torch blues lyrics and musical styles as we can pack into one evening. AATC appreciate glitter and glam while looking out from the stage, so we’ve invited instructor David Tackett, his peers and students at Fred Astaire Dance Studio Northwest to show off their moves. No doubt they will have the joint hopping. You can bet you’ll hear a samba, tango, 12 and 16 bar blues and more. Of course we’ve included holiday songs loaded with the same sass and innuendo as much of our material. I urge you to check out the song “Trim Your Tree.” Promise you’ll be hooked! After the Consequences, do you have any future plans or ideas for new musical projects? AP: I’d very much like to continue working with these jazzers in some capacity, maybe tackle standards. It’s definitely time to work my ear again from the backseat, doing alt country, rock, and funk harmonies. Anyone looking for a seasoned backing vocalist with a great ear, look me up! I even miss musical theater sometimes, so maybe it’s time to audition again. Honestly Andrew, I’m open to everything and want to keep learning and expanding.